Well, we all knew this was coming. 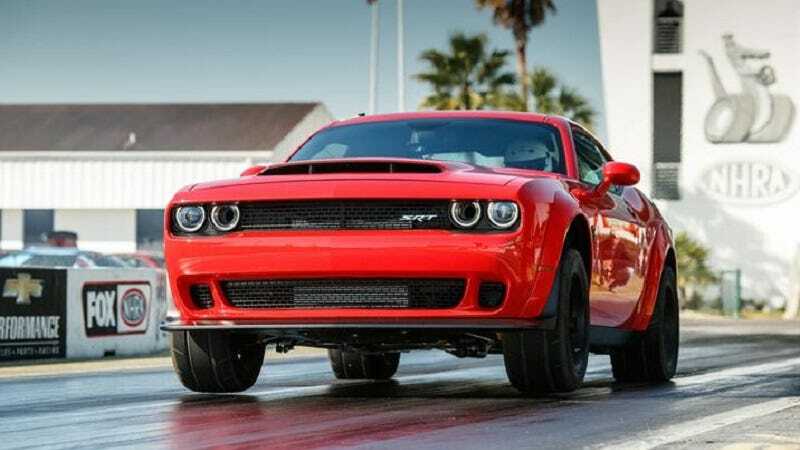 Despite Dodge’s best efforts to mitigate the bonkers markups on its insanely hyped Dodge SRT Challenger Demon, there was bound to be at least a few stores that would attempt to make huge profits on this rare muscle car. Dodge had a pretty ingenious system in mind to stop their own stores from marking up cars, by essentially only accepting orders if there was an assigned customer. Dodge would prioritize production based on the cars that sold for MSRP or below, cars that sold for over sticker would be made later. Of course, this system would not prevent someone from ordering a car from their local Dodge dealer, paying sticker price then reselling it on the second-hand market for a hefty profit. That is exactly what a Colorado dealer, Custom Cars West, is trying to do. They have an “advertise price” (yes, you read that correctly) of $176,398 including the $399 dealer fee. Now, you may notice that the photos are a bit grainy. You’d would expect that while trying to sell a car of this caliber at this price, maybe the dealership would want to put up some better images. There’s a reason behind the bad photos however. The dealer doesn’t actually have this car. Custom Cars West proudly offers for sale this: 2018 Dodge Challenger SRT Demon 6.2 Liter Supercharged Hemi V8 SRT Engine 8 Speed Auto HP90 Transmission B5 Blue Pearl Coat Monotone Paint Demon Laguna/Alcantara Perform Seats Trunk Carpet Kit Rear Seat Option-Leather Comfort Audio Group Leather Seats Delivery Expected 1st Quarter 2018 GUARANTEED DELIVERY!! CAR IS ALREADY ORDERED WE HAVE THE BUILD SHEET For more info call or text us @ 303-733-0135 Photos and VIN Number are not of actual car!! Jalopnik contacted the dealership and they confirmed that the advertised asking price was for real and the car will arrive sometime in the Spring of 2018. Over $176,000 is a lot of money to pay for a Demon. While these cars do have a limited run of only 3,000, it seems like there may be a few dealers out there willing to sell Demons for sticker price—if you are flexible on color. The second-hand Demon market is no different than speculators marking up cars like 911 R or other rare models. If they think there are enough suckers willing to pay almost double the sticker price, there is nothing stopping them from doing so.